I love the smell of bread baking. I knew when mom was making biscuits or bread. I could smell bread baking from upstairs. I just love that smell of bread baking. I'd smell the biscuits and I would run down the stairs as fast as my little legs would carry me. Running through the livingroom, sliding across the kitchen floor so I could crab couple of biscuits, pour white gravy on top of biscuits. 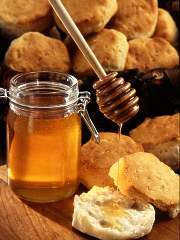 After that, I'd grab couple more biscuits and pour honey on top. Mom was always in the kitchen baking bread. There was fresh baked bread and or biscuits on the kitchen counter top all the time. She would serve baked bread or biscuits at each meal. I was in the kitchen with mom a lot helping her bake. I was mom's little helper in the kitchen. Preheat oven to 425 degrees. Mix together flour, sugar and salt. Cut butter into mixture using a fork. Slowly add milk. Knead dough with fingers. Roll out dough onto a lightly floured surface and roll out to desired thickness. Cut with small biscuit cutter. Butter bottom of pan. Bake 12 to 15 minutes, or until golden brown. Brush warm biscuits with butter, if desired. Enjoy! I am the same as you when it comes to the smell of bread baking. Is there really anything better? These look amazing and you make it sound so easy...oh wait I guess they better be given the name. I love the smell of good food cooking. Indeed the smell of bread baking is irresistible. This is really simple recipe to follow. Thanks for sharing. Hi Yin, I try to make all my recipes, easy, simple to follow, but big on flavor. Thanks for your comment. I LOVE homemade biscuits! yum!